I really wanted that kimono dress (under $40, on sale), but I just got the sweatshirt (on sale, $12.99). 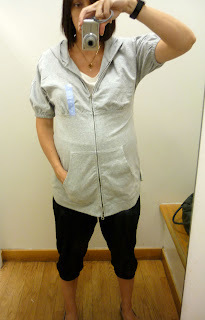 These are both maternity, and the essence of Gap for me: perfect work clothes and perfect casual clothes that should not be passed up, especially when on sale. The sweatshirt is, yes, just a sweatshirt, but one with cute gathered sleeves. Thus it is comfortable and not totally boring. And the dress is such a freaking perfect work maternity dress, it was torture to leave it on the rack. Someone, quick, go buy this. I'm not encouraging anyone to get themselves, how should I put it nicely?, enciente for a flowered wrap dress, but certainly people have done it for less motivation? Hmm. Comments, please. Oh my Gosh, Iv'e been a slack blogger of late and am totally out of the loop...I didn't know you were pregnant! You look amazing - very healthy and with the perfect bump! Anyhoo, congrats on the baby! Why, oh why, did you pass up the dress, lady? You look so cute in the sweatshirt, but that dress....wowza! You are a pillar of strength to have left it behind!